Chop up the salmon fillets and grind them up in a food processor along with the Dijon mustard, horseradish sauce, thyme, sea salt and pepper. Process on “pulse” until the mixture is the consistency of ground beef. Add the finely chopped green onions and mix well. Form into 6 large patties and refrigerate for about an hour. After an hour, take the salmon patties out and heat up the coconut oil in a large skillet on medium-high heat. Cook the patties as you would hamburgers, making sure they’re completely cooked through. 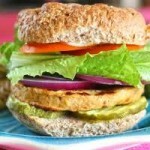 Serve on sprouted wheat/flaxseed buns and with your favorite condiments such as lettuce, tomato, raw cheese slices, etc.